Cosmos flowers are the October birth month flower. They are a very delicate looking flower that comes in both perennial and annual types. Cosmos have about 25 different species. They are commonly grown in Mexico and the southern parts of the United States. They also grow well in Central and South America. This particular type of flower comes in many bright colors. 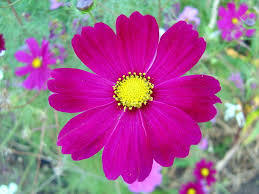 Some popular Cosmos flowers colors are pinks, reds, yellow, magenta, and white. They grow to be anywhere from 2 to 4 feet tall. Whichever color you choose, most varieties have a yellow circle in the center. I like Cosmos because they have such a pretty look to them. Almost like a wide circular fan. The petals stretch open to reveal the delicate yellow center. They grow upon tall stems, and are surrounded by whimsical looking foliage. Everything about this flower just establishes its look of delicateness. The flower itself can grow in a moderate based soil. The soil will need to be moist, but will have to have good drainage. The roots and stems can rot in too much moisture. Cosmos flowers grow their best when planted in a spot with full sun. You can begin to plant the seeds in the middle toward the end of spring. They grow well in the cooler temperatures of the springtime. When they begin to grow, the October birth month flower may have some problems. You may notice some mildew or mold on the leaves. Also if planted in moist wet soil, they can get stem and root rot. Again, make sure they are in well-drained soil. Once planted, Cosmos flowers should begin to grow in the summer, and continue growing into the fall, if you take care of them. Once you see little flower buds beginning to grow, just water them regularly, careful not to make the soil to wet. The most common species that you usually see is the Cosmos bipinnatus. 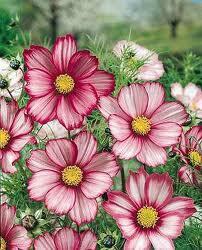 They are commonly known as Garden Cosmos. They are about 2 feet tall and grow in colors of white, red, and pink. The bipinnatus comes in different kinds such as Candy Stripes, Daydream, Seashells, and Sonata. Sonatas are dwarfs that have blossoms that are multicolored. Candy Stripes are white blooms with an outer edging in the petals that is crimson red. Daydream flowers are predominately white, with a pink center. Seashells come in pinks and white. They may start out in one color and then have a different shade at the tips of their petals. If you live in an area with hot summer sun, you may want to plant Cosmos sulfurous. They adapt better then Garden cosmos to the hot sun. They bloom flowers in yellows and oranges. Some types of this variety also bloom doubled petals. The variety you choose will have to be a choice of what type of colors or color scheme you are working on for your garden. Also think about the weather in your region before planting a specific species. THE TRANSLUCENT FLOWERS OF the cosmos, a favorite garden annual for generations, have been a relatively recent discovery for me. I first noticed the rose-hued flowers of Cosmos bipinnatus in rambling country gardens in the mountains of northeastern Georgia. I was captivated by the flowers’ airborne effect; they seemed to float on their tall, gently waving stalks. At dusk the whiteflowered varieties appeared as stars suspended above the feathery foliage and slender stems, which became almost invisible at twilight. Cosmos is often described as an easy flower for beginners, as almost nothing can go wrong. Worthy types range from the rose, pink and white of C. bipinnatus to the fiery oranges and golds of C. sulphureus, both annuals, and even to the little-known, chocolate-scented black cosmos (C. atrosanguineus), a perennial in Zones 7 through 10. The cosmos is a member of the daisy or composite family, a fact not surprising given the classic daisy form of its flowers. C. bipinnatus is a tall, sprawling plant, towering from 4 to 6 feet or more. I have grown some problem specimens that billowed taller than 6 feet and were felled by the slightest wind. With a little foresight, however, this problem can be solved by supporting taller varieties with stakes, or more sensibly, by pinching the plants back early in their development to encourage compactness. In its most common form, C. bipinnatus has single flowers of rose, pinkish lavender, rich maroon or white. Hybridizers stay busy, however, creating new varieties. ‘Seashells’ is particularly intriguing, with its tubular petals, each flaring into a trumpet shape at the tip. The petals of ‘Candy Stripe’ are vivid white outlined with crimson, giving the look of a Christmas candy cane. ‘Daydream’ produces a misty, almost ethereal effect with its frosty pale-pink petals deepening to rose at the center. As an added bonus, the three previously mentioned varieties average from 30 to 36 inches in height, making them a good choice for smaller gardens. Gardeners with a very small planting area would do well to try the dwarf cosmos ‘Sonata White.’ Plants of this variety grow only 2 feet in height, bearing snowy white flowers with golden yellow centers. Evocative of the tropical climate from which it came, Cosmos sulphureus lights up gardens with a bold, bright color scheme that ranges from golden yellow to blazing orange-red. 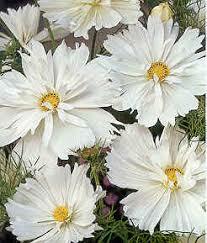 This type of cosmos tends to be sturdier than C. bipinnatus; taller varieties, however, may require support. The smallest hybrids, usually about a foot high, resemble marigolds in the garden. Two of these, ‘Ladybird’ and ‘Sunny Gold,’ are tolerant of dry weather and heat, and produce plenty of semidouble blooms until frost. The cosmos’s dependability is certainly refreshing. Its large, easy-to-handle seeds may be sown directly in the garden and can almost always be counted on for success, a trait that is true of too few plants. Space the seeds at least an inch apart, as growth is usually quite rapid. 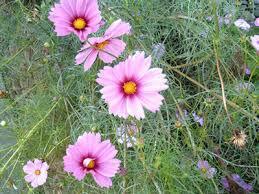 Because it needs warm soil to germinate, cosmos should not be sown until well after the last frost of spring. Choose a site with lots of sun and sharply drained soil of average to low fertility. Fertilizers will encourage rich green foliage instead of flowers. Plant taller varieties of cosmos well to the back of mixed borders. They are effective against walls or railings or planted as a screen. When mixing cosmos with other flowers, it helps to remember that many varieties do not reach their peak until late in the season. Drifts of cosmos mist the background of my garden in early fall, putting out their flowers alongside dahlias and chrysanthemums. Despite its fragile appearance, the cosmos makes an excellent cut flower. Another characteristic of cosmos — one that some gardeners may consider a drawback — is its ability for rampant self-seeding. I discover seedlings in the most unexpected places, from cracks in the patio to the large compost pile in the woods. Each blossom produces a cluster of about 30 or 40 seeds that are particularly appealing to goldfinches; I often see these lovely little birds feeding on faded cosmos plants in November. Other winged creatures are drawn to cosmos as well, including butterflies and hummingbirds, which drink nectar from their favorite crimson and maroon varieties. With the departure of the hummingbirds for warmer regions and the first frost, the cosmos season comes to an abrupt end. Discovering this carefree flower has proved a delight for me, and I look forward to its unassuming beauty every summer. If you are a new gardener, Cosmos are a great plant to start with. Fast growing, there is little that can go wrong with this tall growing plant. 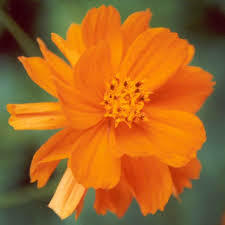 Cosmos are native to Central America and Mexico. They grow quickly to a height of 4-5 feet. Brightly colored single or double flowers include white, pink, orange,yellow, and scarlet. Cosmos look great at the back of the garden and in informal arrangements. Cosmos are grown from large seeds, making them easy to plant. They germinate quickly and never stop from there, normally growing four to five feet in a season. Sow directly into the garden just before the last frost in your area. Space plants 12 inches apart and thin to 18 inches. While most Cosmos are annuals, there are perennial varieties. Perennial varieties are Rhizomes and can also be propagated by division. Cosmos prefer full sun to partial shade. They will do well in both average and poor soils. They are tolerant dry soil conditions. Add a general purpose fertilizer once or twice a season. Taller plants mayrequire staking. However, this can be avoided if planted in an area protected from the wind. Insects and disease problems are very rare for Cosmos. If problems occur, treat early with organic or chemical insect repellents and fungicide. Cosmos give you a big bang for your buck. Growing carefree from seed, these annuals (meaning they grow just one year) fill a flowerbed with color and are great cut flowers. Cosmos grow anywhere from 1 foot to 3 feet high, depending on the variety. STEP 1: Check out your local garden center in spring for cosmos seeds and seedlings. Because they’re so fast and easy to grow from seed, however, many nurseries don’t carry them as seedlings. STEP 3: Plant indoors four to six weeks before your region’s average last frost date to get earliest bloom. Otherwise, plant outdoors directly in the soil after the last frost date, 8 inches apart in full sun in average soil. STEP 4: Trim spent blooms to encourage a longer bloom period. STEP 5: Pull out plants, and discard in fall once frost kills them. Cosmos require moderate to little water. 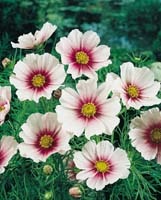 Plant cosmos in groups of at least a dozen to take advantage of their wildflower-like effect. Cosmos don’t thrive in overly rich soil. They’ll produce lots of tall foliage but fewer flowers.